Mile High Eats and “Experiences” | Bloom. It’s been a bit of a crazy week in North Central Indiana. The National Weather Service confirmed that EF-2 tornadoes came through our county last Sunday, one less than two miles away from our home. 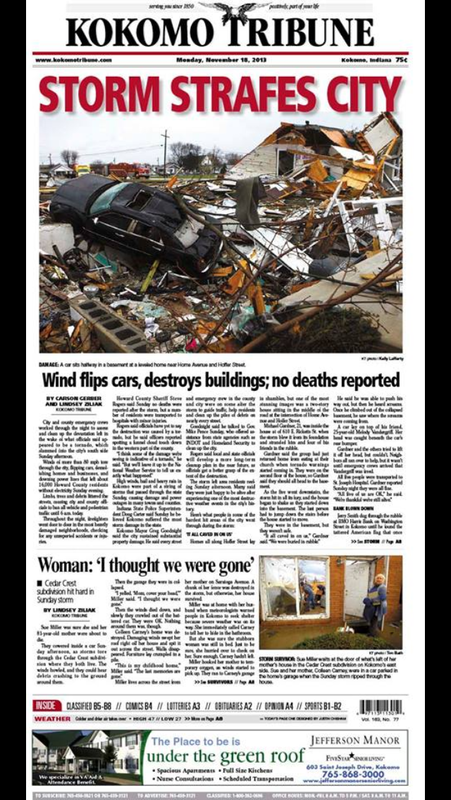 Here was the cover of our city’s paper on Monday morning. I tried to buy a copy but they were sold out across town by the afternoon. All week long we have heard stories of damage. Driving through town I have seen damage that I really had only seen in photos or on the news. Fortunately, patio furniture strewn across the lawn was all the “damage” to our home and property. We also heard stories of where people were during the storm. We had just arrived back to Indy from a long weekend in Denver when we heard on the radio that a tornado was on the ground and headed to our little town. The trip was a bit of a celebration for the end of harvest for Adam, my new job (started this past Monday! ), and just for fun! We chose Denver because it always seems like the spring board to the next place, be it the mountains, California, where ever. We had never really been to the city, so we decided to take a little time to enjoy it. With nothing on the agenda to do but to be together and relax, we had a great time. In fact, my dear darling “country boy” said that he could live in the city of Denver multiple times throughout the long weekend. We stayed at a hotel on 16th Street, a major business district downtown that had virtually every major restaurant and store you could think of. We also didn’t rent a car, but it worked out great. Denver has public transportation down. A free bus system runs up and down 16th Street for about two miles making it easy to get to different areas. Denver gets a bad reputation for having killer winters because we all imagine the snow from the mountains. I was prepared for cold temps, but it turns out we were warm. We walked a lot and did not need a jacket until the evenings. Not bad for November. Denver is actually similar to a micro climate, protected by the mountains, and boasts over three hundred days of sunshine each year. What I didn’t realize was that nearly any restaurant in the city was onboard with the movement. 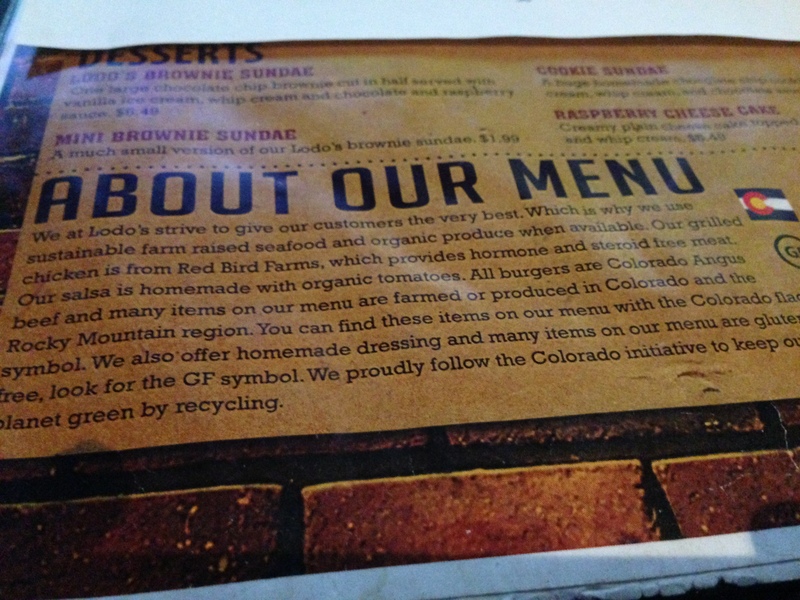 Granted we weren’t going to big chains and did hop off the beaten path, but each restaurant we visited had a blurb on their menu sharing where they source local produce, eggs, poultry, beef, game, whatever, from. 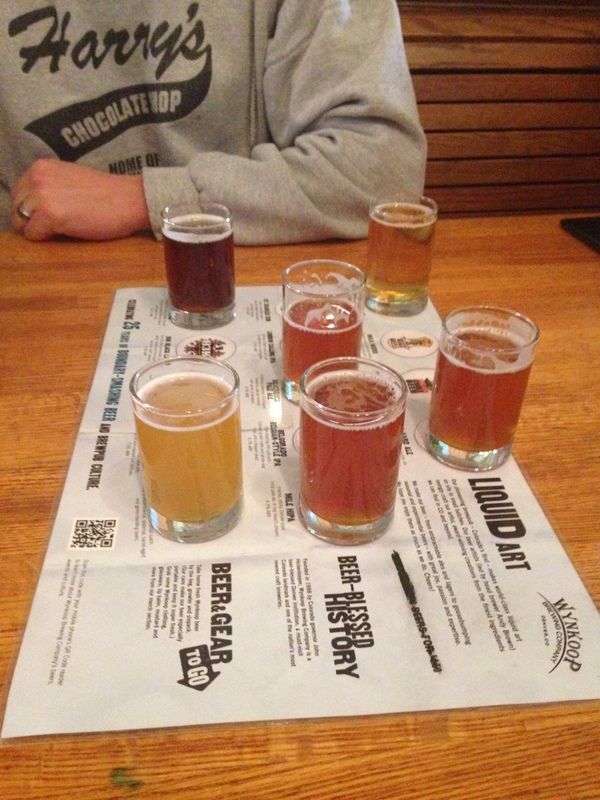 We began with lunch at Wynkoop Brewing Company, Denver’s first craft brewery, after checking into our hotel. Craft beers are now pretty much the heart beat of Denver, but in the eighties it all began here. We started with a flight of the home brews as we couldn’t decide between all the IPA’s, lagers, and ale’s. My favorites were the Rail Yard Ale, one of the brewery’s best sellers and a seasonal peach wheat. Starving, as our stomachs were still on east coast time, we also ordered lunch. Adam had the Pork Bahn Mi, an Asian twist pulled pork. I know he choose it because sriracha was listed as a topping. The kid has a hard time saying “no” to anything with sriracha. 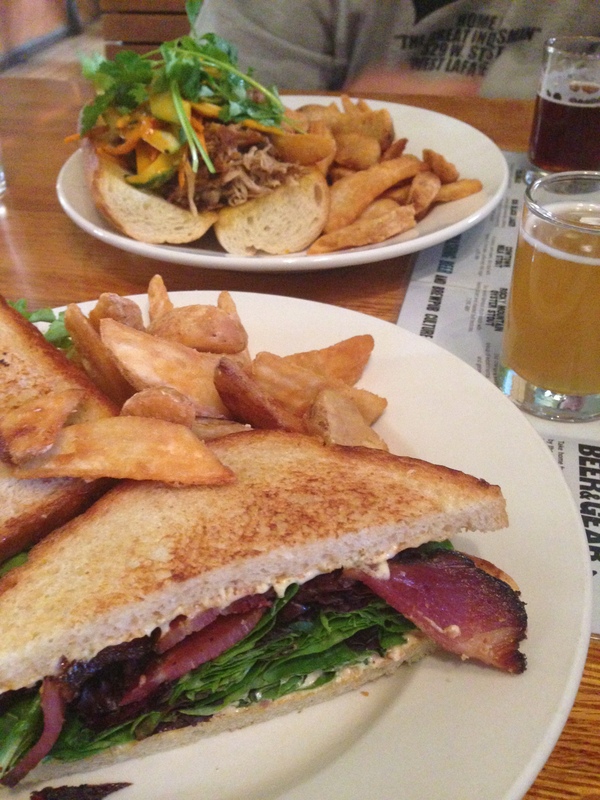 I had a BLT with thick slices of Denver Bacon, juicy heirloom tomatoes and baby lettuces. Before going out west, I asked for some Facebook input on must see restaurants in Denver. 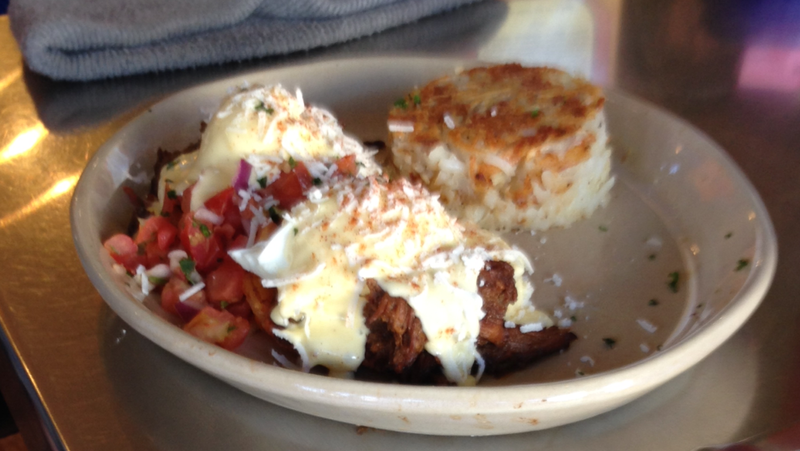 The resounding recommendation was for a brunch spot called Snooze. 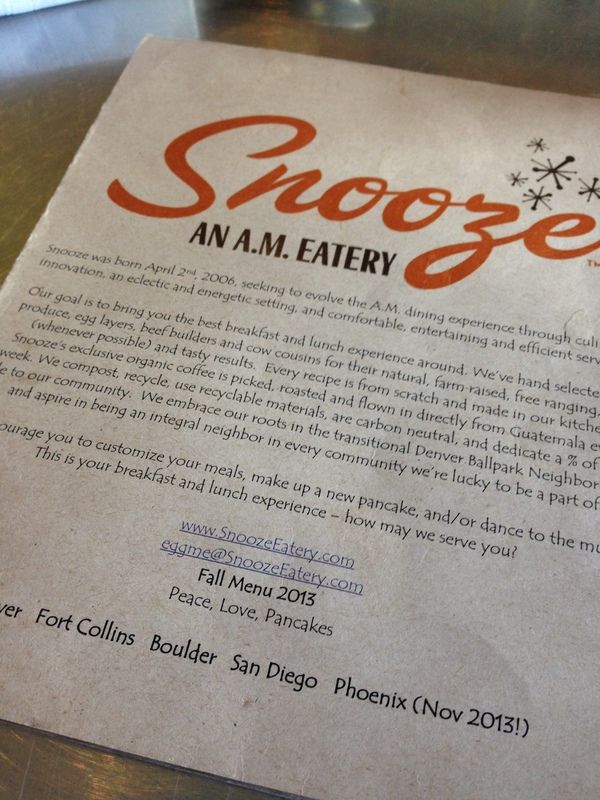 Snooze really came into popularity thanks to MTV’s Real World Denver as the cast always ate there. All the recommendations included a warning that anytime of day you show up, there will be a wait. And there was. A forty minute wait… for brunch… on a Friday morning. I could sense Adam’s patience, or lack there of, so I assured him that everyone said this would happen but it would be worth it. … A bloody mary also helped my cause. 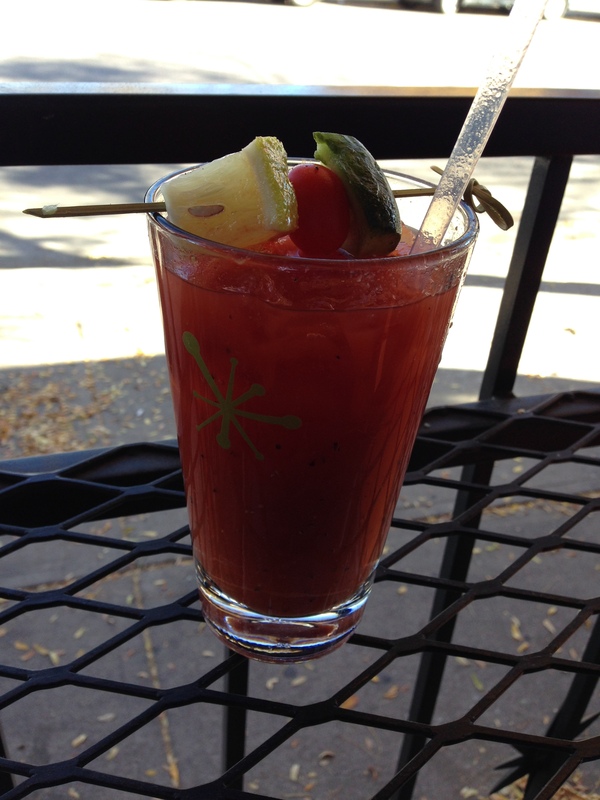 The bloodys were made with house made bloody mary mix and different hot pepper infused vodkas. I ordered a gazpacho bloody mary and it was fabulous. Adam had a spicy one, of course. 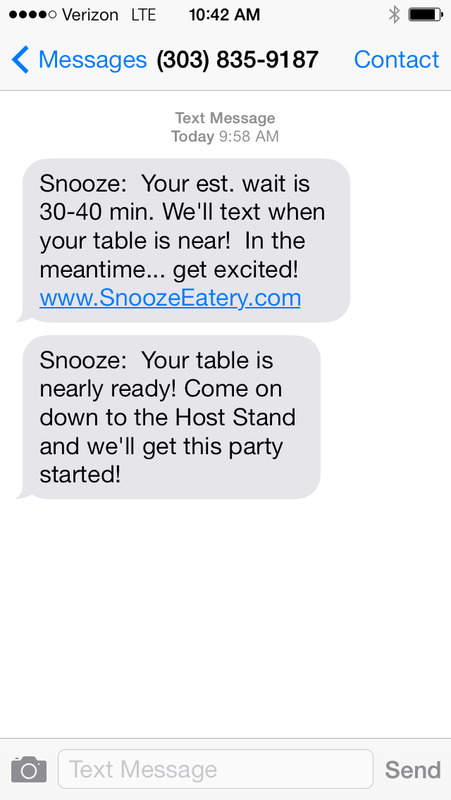 We were made aware our table was nearly ready via text message and headed into the diner. Looking around the restaurant I knew we were in for some good food. There were huge pancakes, egg plates and french toast that looked more like dessert. Adam and I both opted for savory options versus the sweets. 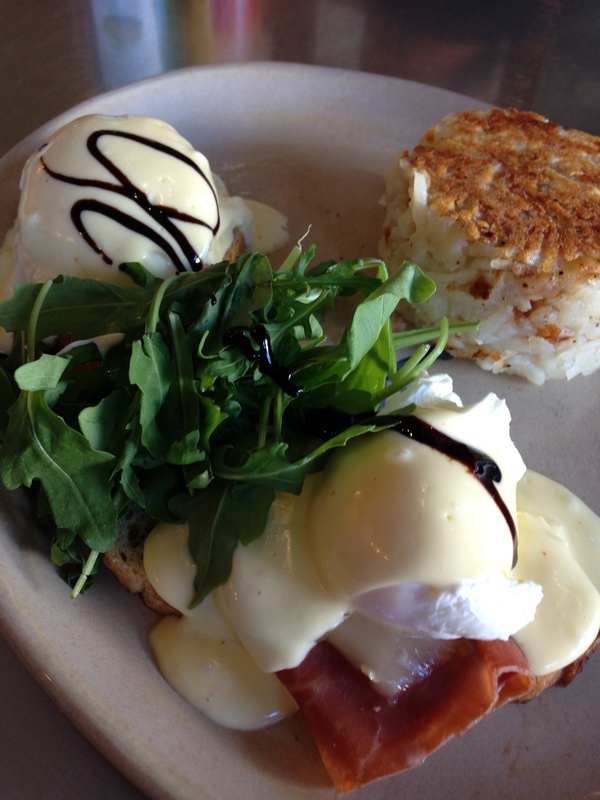 Italian style eggs Benedict for me complete with prosciutto, cheesy hollandaise topped with balsamic and peppery arugula. 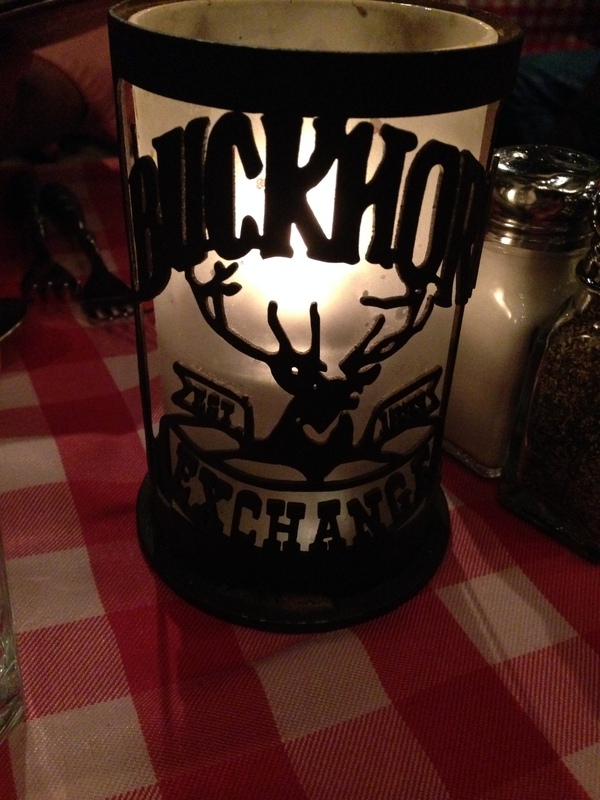 Our final night we had reservations at Buckhorn Exchange, per recommendation from my aunt claiming it is “an experience.” She also recommended the Brown Hotel as a great place for a cocktail so we decided to have a drink there before heading to dinner. 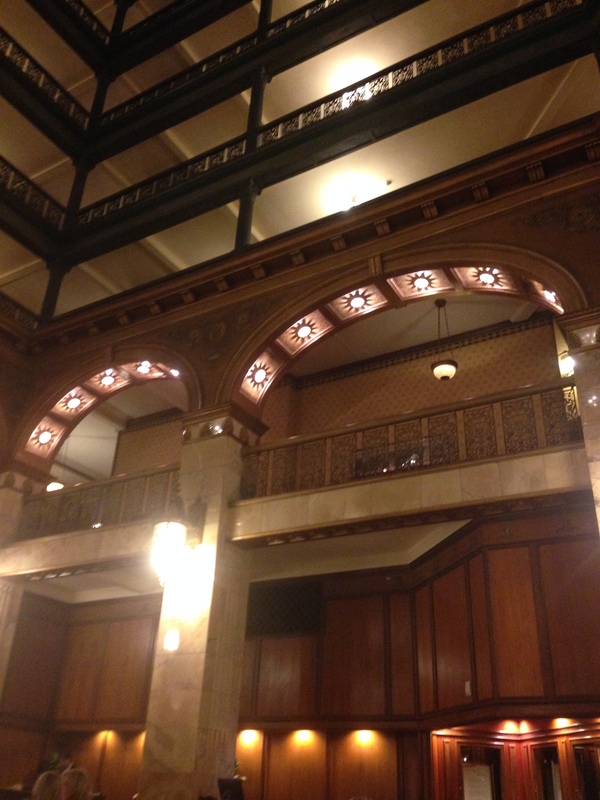 The Brown Palace is a one hundred and thirty year old hotel, rich with Denver history as it was one of the first buildings in the city. 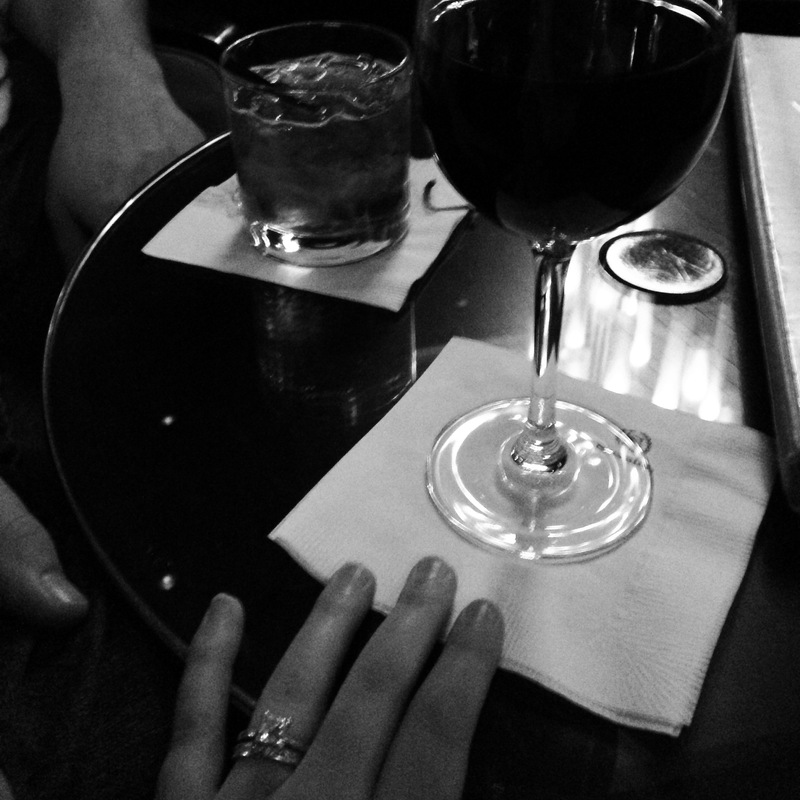 We took a seat in the lobby as a pianist serenaded the many couples cozied up with martini’s. 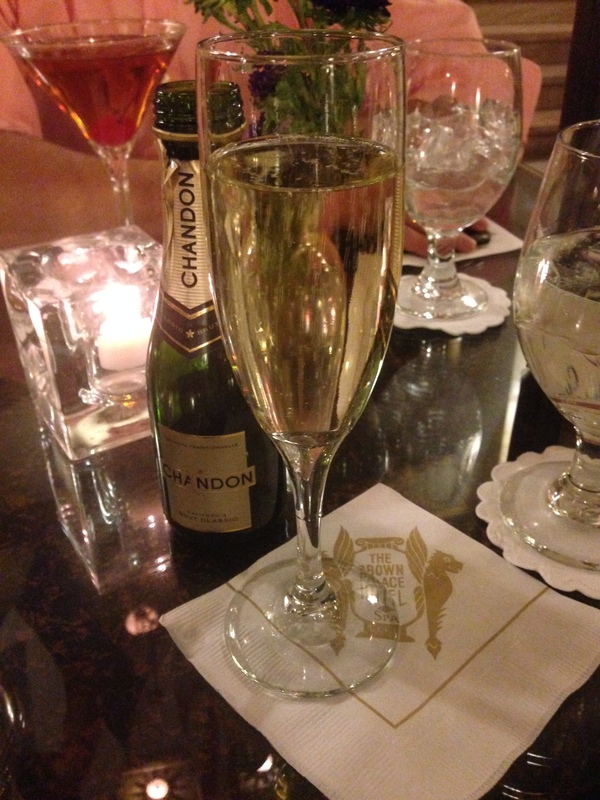 After a weekend full of beer, I was ready for a glass of champagne. Adam had a Manhattan. We had a great conversation about friendships and our good fortune with friends as we admired the exquisite architecture. I got a little nervous… What did everyone mean by this? “It’s just a little guy,” Adam announced as we pulled up to a maybe thirty foot wide building. The driver agreed but said it was deep and that tables went way back into the restaurant. It was like going back in time into the wild, wild west. 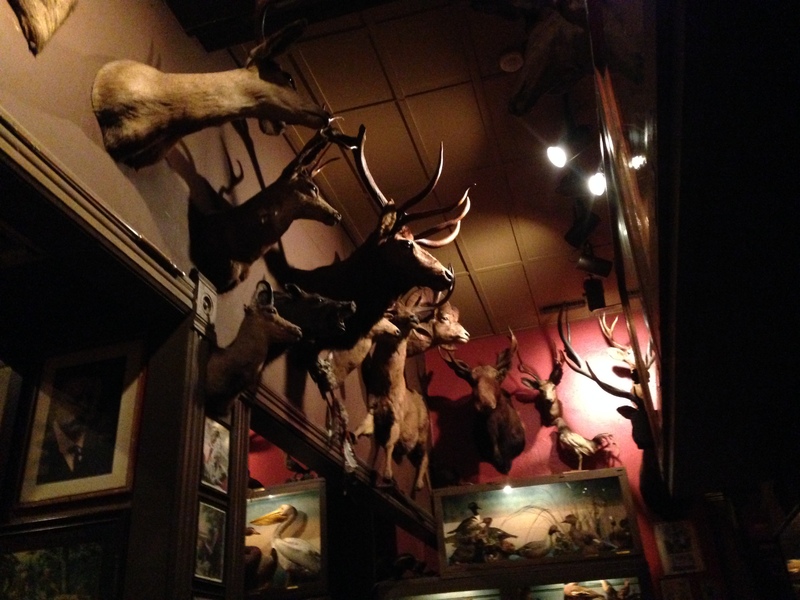 The building was warm, tables had red checked table cloths, old framed black and white photos covered the walls… in addition to hundreds upon hundreds of mounted game heads and furs. 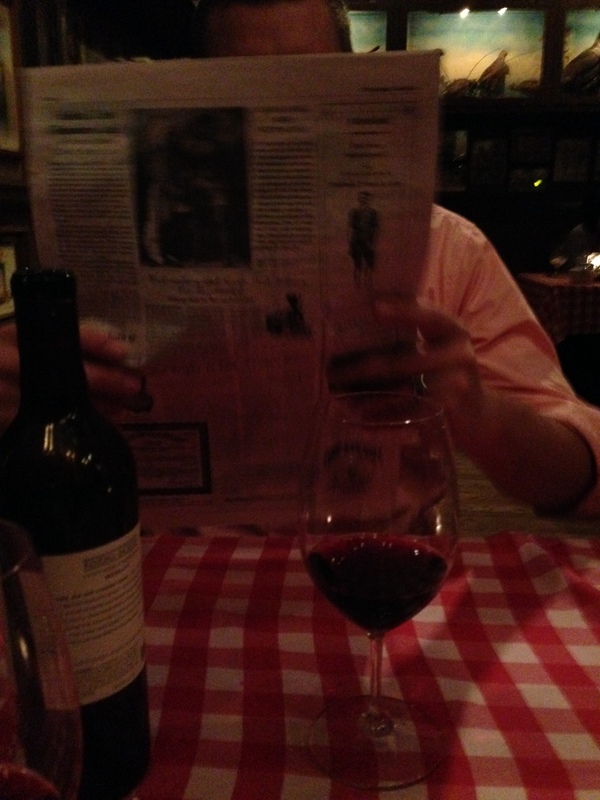 Our menu’s were designed like a newspaper, explaining the history of the restaurant. 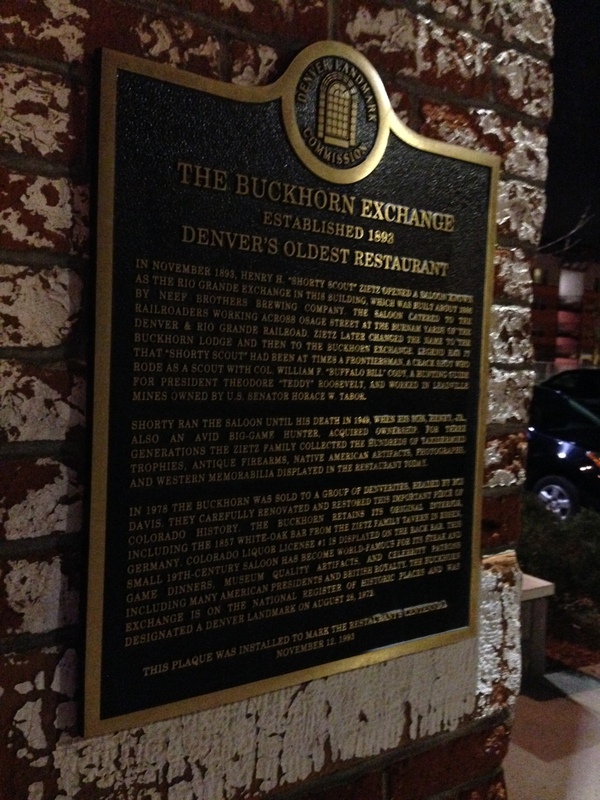 The Buckhorn Exchange opened in the late 1800’s and was a favorite of Teddy Rossevelt. There was even a story about a night in the year 1900 when a masked bad guy held everyone in the restaurant hostage, robbing them of any cash or valuables and injuring barmaids. It really was part of the Wild West! Entrees included beef and buffalo, like many other restaurants in Denver, but it also included all sorts of wild game including elk, quail, game hens, lamb and duck. 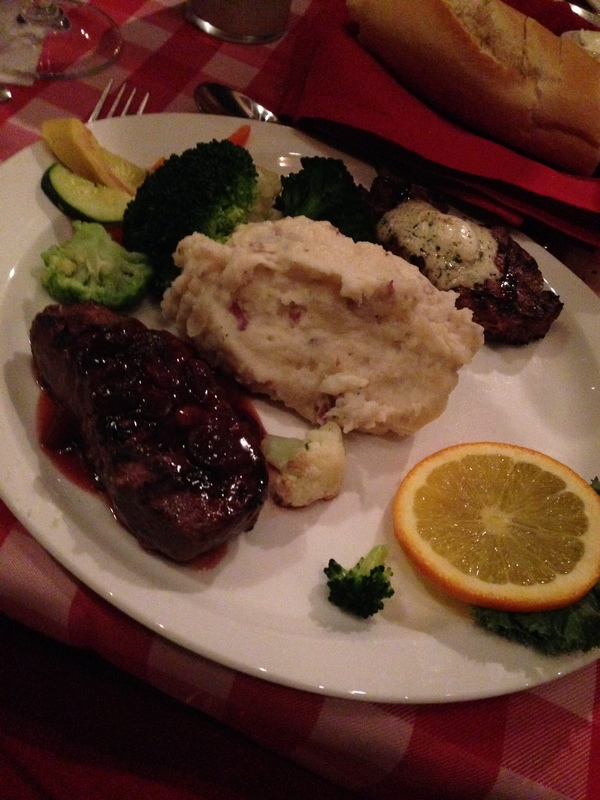 Adam and I both had the night’s special, buffalo with garlic butter and elk with a spiced cranberry sauce. Our meals were also served with a garden salad and starch. I chose smashed potatoes and Adam had a baked potato, two things we never do at home so it was a big treat. The meal was delish, but what was even better was that it was just a piece of a great night that capped off a memorable weekend together. Below are links to all the restaurants we tried. Loved everything, but couldn’t write about them all. 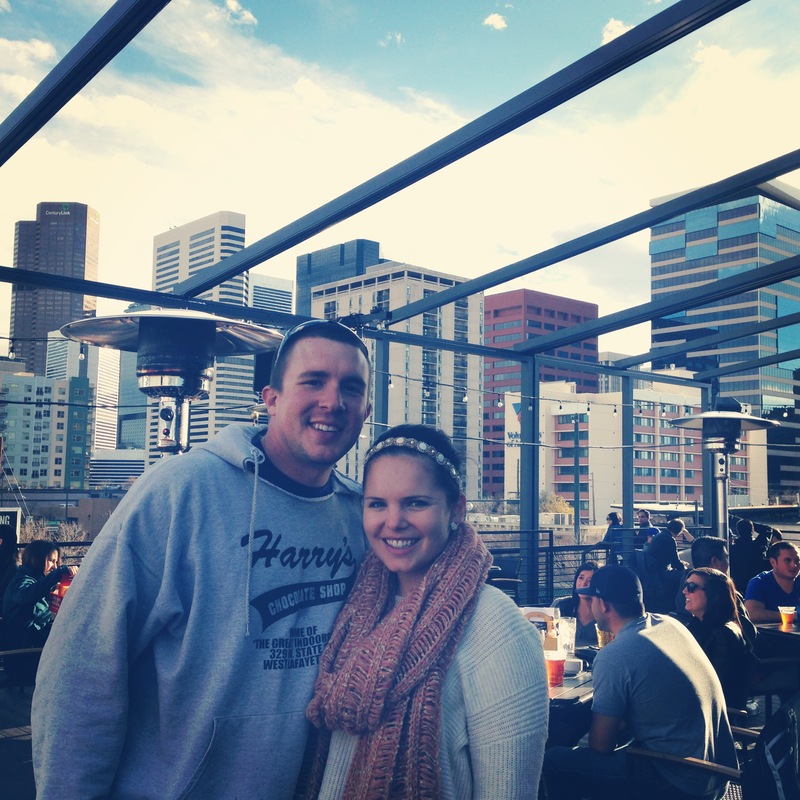 Check them out on your visit to the Mile High City! 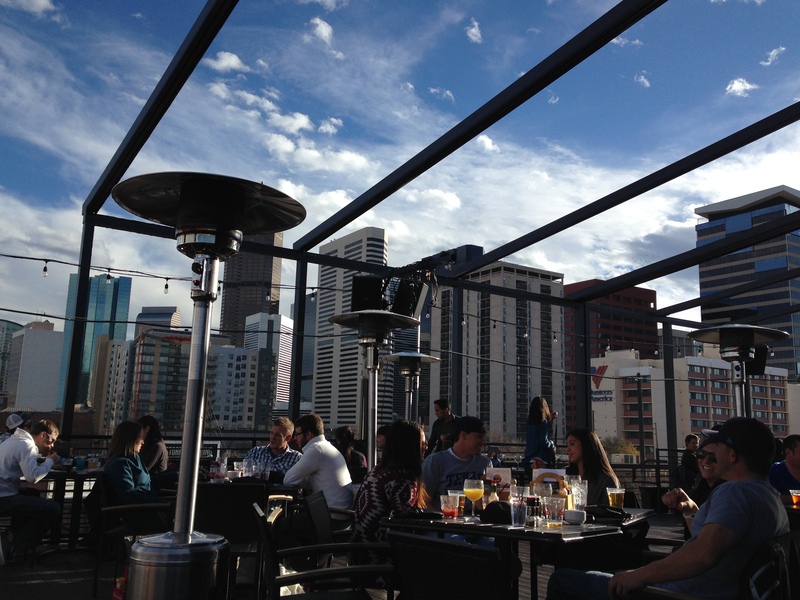 http://www.lodosbarandgrill.com/ — Located right in the LoDo neighborhood. Great place for a game. http://www.breckbrew.com/ — Great Buffalo Burgers and Brews by Coors Field. http://viewhouse.com/ — Awesome patio on top floor with great views of the city. Bottomless mimosas and Bloody Mary’s on Saturdays in addition to a brunch menu. http://bravapizza.com/ — Similar to a food truck; Mobil stone pizza oven with a two tap kegerator. Great, quick flatbread pizza’s right on a patio on 16th Stree. … when we go back I am DYING to try The Kitchen and Squeaky Bean! Have you been there? !